Whisk olive oil, vinegar, garlic, and crushed red pepper in large bowl. Add radicchio and toss to coat. Marinate 15 minutes. Prepare grill (medium heat). Drain marinade into small bowl. 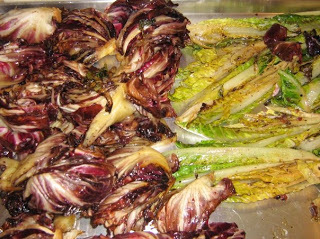 Place radicchio and romaine on grill; sprinkle with sea salt and fresh cracked pepper. Grill until edges are crisp and slightly charred, turning occasionally, about 6 minutes. Transfer to serving platter. Drizzle with reserved marinade and sprinkle with cheese shavings.